Title: The Monster In The Streets! 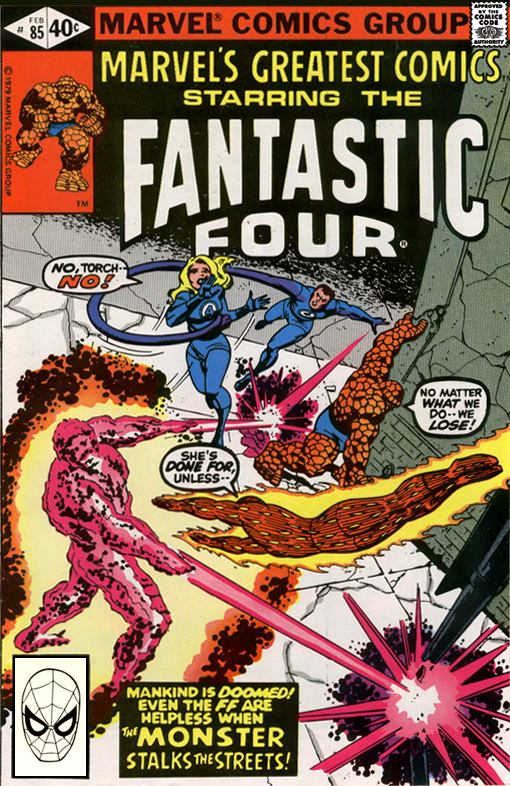 Synopsis: Marvel's Greatest Comics #85 reprints Fantastic Four #120 (December 1970). Ben, Johnny and Crystal are enjoying hot dogs from a New York City street vendor on a beautiful sunny day when Crystal suddenly feels faint. An explosion in the distance provides a distraction from Crystal's well being and the heroes spring into action as the building above them starts to crumble. Crystal falls unconscious after using her elemental energy bolts and Johnny flies her back to the Baxter Building to have her examined by Reed. Back at the Fantastic Four's headquarters, Reed is working on an experiment designed to transform the Thing back to his human form when Johnny bursts in with Crystal in his arms. Sue is clothes shopping when the store she is in starts to collapse and the heroine sees a strange glowing mass passing by on the street outside. Going to investigate, Sue encounters Dr. Zolten Rambow, who is following the mass under the belief that it is a being from another planet or dimension. Back at the Baxter Building, Reed does an analysis of Crystal's blood and determines that she must return to her home with the Inhumans. He also discovers a compound in Crystal's blood that he believes may help transform the Thing back to his human form. Johnny is angry and heartbroken at the prospect of losing Crystal, but understands that she must go and kisses her goodbye before she teleports away with Lockjaw. He turns into the Human Torch and flies away to blow off some steam, stopping when he sees the glowing mass and his sister in danger. He flies down to help, but his flame sputters out and he is rendered helpless. Only the Invisible Girl's force field can contain the mass, so the Torch files off to get help. He returns to the Baxter Building where Johnny finds that Reed has just started an experiment to transform the Thing. The team's leader in put in the terrible position of abandoning his best friend in the middle of a delicate experiment or his wife in her moment of need! To be continued next issue in The Startling Solution! Thanks, Dave! I appreciate the kinds words.